With so many people on Cubed3 playing this game right now, we could really use an official topic to ask questions in, arrange some meet ups or just talk about anything concerning the game. Be sure to add your Nintendo 3DS code to the Animal Crossing: New Leaf list above! First up, what name/village name did everybody pick and how are you enjoying it so far? I've picked Link and Hyrule as I did the same in Wild World and Let's go to the City back then. Starting up is typically pretty slow since full days need to pass to progress but I'm almost approved as a mayor and can't wait to unlock so much stuff that's still inaccessible. Having a blast so far anyway. One feature I'd really like to highlight is the the best friends one. The game differentiates between people on your 3DS friend list and best friends, as you can add each other in the game itself (bottom left corner of the touch screen when playing with others) and activate messaging. This way you can conveniently see who's online and send instant messages to either a single person or everybody who is online (even if they're playing alone in their village) on your BFF list. You can also open your gate exclusively for them if you want to. Great little feature that more people need to know about and use. One cool use for it could be quickly letting friends know your current turnip price (two prices a day, one after Re-Tail opens and another one at noon for the rest of the day) and let them come over to sell their turnips at a profit. 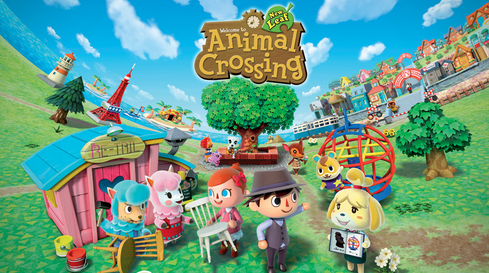 [img]http://images3.wikia.nocookie.net/__cb20130614100759/animalcrossing/images/a/af/Animal_Crossing_New_Leaf_Banner.png[/img] With so many people on Cubed3 playing this game right now, we could really use an official topic to ask questions in, arrange some meet ups or just talk about anything concerning the game. Be sure to add your Nintendo 3DS code to the Animal Crossing: New Leaf list above! Just click on "Add this game to your profile" to get started :) ------ First up, what name/village name did everybody pick and how are you enjoying it so far? I've picked Link and Hyrule as I did the same in Wild World and Let's go to the City back then. Starting up is typically pretty slow since full days need to pass to progress but I'm almost approved as a mayor and can't wait to unlock so much stuff that's still inaccessible. Having a blast so far anyway. :awesome: One feature I'd really like to highlight is the the best friends one. The game differentiates between people on your 3DS friend list and best friends, as you can add each other in the game itself (bottom left corner of the touch screen when playing with others) and activate messaging. This way you can conveniently see who's online and send instant messages to either a single person or everybody who is online (even if they're playing alone in their village) on your BFF list. You can also open your gate exclusively for them if you want to. Great little feature that more people need to know about and use. :D One cool use for it could be quickly letting friends know your current turnip price (two prices a day, one after Re-Tail opens and another one at noon for the rest of the day) and let them come over to sell their turnips at a profit. Really loving the improvements made in this game. My first Animal Crossing game was City Folk -- or the long-winded "Let's Go to the City" as it was known in Europe. (What were they thinking?) Even on top of the Wii game, this latest instalment has a TONNE of new content and a bunch of improvements have been made. As SirLink already highlighted, I really love the best friends feature and I also love how you can choose to invite only people you have on your best friends list, eliminating those little rascals that may steal your flowers or ruin your town in any other way. Another thing I like is that you can close the gates, even when you have visitors over, meaning you can play with a single person without any interruptions from others. This also helps if you're OCD about some things and don't want anything getting wrecked. This is going to be a game that lasts me for a long time, just like its predecessor. Rather than playing in short bursts each day, I've found myself fishing for hours and getting hooked (pardon the pun) on the experience! Really loving the improvements made in this game. My first Animal Crossing game was City Folk -- or the long-winded "Let's Go to the City" as it was known in Europe. (What were they thinking?) Even on top of the Wii game, this latest instalment has a TONNE of new content and a bunch of improvements have been made. As SirLink already highlighted, I really love the best friends feature and I also love how you can choose to invite [i]only[/i] people you have on your best friends list, eliminating those little rascals that may steal your flowers or ruin your town in any other way. Another thing I like is that you can close the gates, even when you have visitors over, meaning you can play with a single person without any interruptions from others. This also helps if you're OCD about some things and don't want anything getting wrecked. Overall, it's been a pretty slow start, but as I'm slowly unlocking new things I'm beginning to like the game even more so than I did when I first started playing. (Which was a [b]lot[/b], by the way) This is going to be a game that lasts me for a long time, just like its predecessor. Rather than playing in short bursts each day, I've found myself fishing for hours and getting hooked (pardon the pun) on the experience! Tis my first Animal Crossing game and have really enjoyed the first day. My town is called Balamb named after the beautiful seaside town in Final Fantasy 8 and my character is simply called Wayne. The highlight of day 1 was getting a functioning Blue Falcon to decorate my house (once it's built that is) Hope to visit everyones town! Tis my first Animal Crossing game and have really enjoyed the first day. My town is called Balamb named after the beautiful seaside town in Final Fantasy 8 and my character is simply called Wayne. The highlight of day 1 was getting a functioning Blue Falcon to decorate my house (once it's built that is) :) Hope to visit everyones town! *Sigh* I wish I had a 3DS for this game. I loved WIld World on DS. Working like a fiend isn't very fun... and surprisingly isn't very fiendish either. Just click the "Add this game to your profile" button above to add your 3DS Friend Code to the Animal Crossing: New Leaf list! You can also join the chatrooms for the game by clicking Chat Room above. All told, after making some museum donations, expecting to clear well over 300K when Re-Tail opens. Expand my house or build something? Since I'm no professional player at Animal Crossing (haven't played any since the Gamecube game), I'm not making any fast progress. I don't even have access to an axe yet. Link and Mush, I got kicked out of our online session the other day, so you're not saved into my friends list. Since I'm no professional player at Animal Crossing (haven't played any since the Gamecube game), I'm not making any fast progress. I don't even have access to an axe yet. My town is named Atlantis, after the mythical city from the Stargate mythos :P (Yeah I'm in the process of going through the whole series again at the moment, haha) Link and Mush, I got kicked out of our online session the other day, so you're not saved into my friends list. 10 coelacanths? What the hell? I was over at Mush's village when it was raining there and we searched for at least an hour and none of us even saw one! How in the world did you find 10? It was night for us too, although he does appear earlier than that according to my sources. I seem to have a lot more luck catching bugs on the island. They're much more common than sharks and still worth around 8,000 on average. Lots of emperor butterflies appear there too and those 2,500 for each add up quite quickly. It's going to be even better with the Bell Boom Ordinance that will be active for me starting today, causing buying and selling prices to rise but fixed payments like house/public projects will stay the same if my information is correct. I would go for Early Bird or Night Owl to change shop opening times but one is inconvenient during the week and the other during the weekend and I can't be bothered changing them all the time. @Rudy: We'll meet up again eventually, I'm pretty busy lately so I usually just play with Mush for a bit. Speaking of new players, I'm thinking of writing a small guide for Animal Crossing etiquette. I'm very concerned about my town, so I won't just let anyone visit me. Some of the things in it would be pretty obvious but one would be surprised how many people don't quite know what's okay and what's not. Of course, when someone says he doesn't care if you accidentally destroy some of his flowers then it's no big deal. This would be more of a general guideline to follow and go from there as you play with the same players regularly. 10 coelacanths? What the hell? I was over at Mush's village when it was raining there and we searched for at least an hour and none of us even saw one! How in the world did you find 10? It was night for us too, although he does appear earlier than that according to my sources. I seem to have a lot more luck catching bugs on the island. They're much more common than sharks and still worth around 8,000 on average. Lots of emperor butterflies appear there too and those 2,500 for each add up quite quickly. It's going to be even better with the Bell Boom Ordinance that will be active for me starting today, causing buying and selling prices to rise but fixed payments like house/public projects will stay the same if my information is correct. I would go for Early Bird or Night Owl to change shop opening times but one is inconvenient during the week and the other during the weekend and I can't be bothered changing them all the time. @Rudy: We'll meet up again eventually, I'm pretty busy lately so I usually just play with Mush for a bit. Speaking of new players, I'm thinking of writing a small guide for Animal Crossing etiquette. I'm very concerned about my town, so I won't just let anyone visit me. Some of the things in it would be pretty obvious but one would be surprised how many people don't quite know what's okay and what's not. Of course, when someone says he doesn't care if you accidentally destroy some of his flowers then it's no big deal. This would be more of a general guideline to follow and go from there as you play with the same players regularly. Best time for the money fish appears to be between 11:30 and midnight (in the rain of course). Number of Coelacanths and Sharks tailed off pretty dramatically past midnight, but was still getting some up until 1am when I finally called it a night. Best night of fishing for me in all my years of Animal Crossing, by far! I'd forgotten I had Bell Boom as well, so ended up making nearly 400K on the haul. Paid off my mortgage and built another bridge. edit: Good idea on the etiquette guide! Depending on if we get a flood of new members too, we might want to develop a whitelist of players who are verified as non-griefers. That'll depend on if we get a bunch of new folks, though. [quote]10 coelacanths? What the hell? I was over at Mush's village when it was raining there and we searched for at least an hour and none of us even saw one! How in the world did you find 10? It was night for us too, although he does appear earlier than that according to my sources. [/quote] Best time for the money fish appears to be between 11:30 and midnight (in the rain of course). Number of Coelacanths and Sharks tailed off pretty dramatically past midnight, but was still getting some up until 1am when I finally called it a night. Best night of fishing for me in all my years of Animal Crossing, by far! I'd forgotten I had Bell Boom as well, so ended up making nearly 400K on the haul. Paid off my mortgage and built another bridge. I'll have to get you lot added to my 3DS - still haven't bothered with contacts and friendslist and whatnot since my only game before Animal Crossing was Fire Emblem. edit: Just added you all in this thread - my info in my profile :) edit: Good idea on the etiquette guide! Depending on if we get a flood of new members too, we might want to develop a whitelist of players who are verified as non-griefers. That'll depend on if we get a bunch of new folks, though. I think we were just a bit earlier than that at around 10pm-11pm. Unless it's raining on Friday or Saturday, I won't be able to stay up that long then. I forgot when exactly I had my massive hauls in Wild World but I remember getting Blue Marlins and Sharks all the time and in New Leaf I haven't found a single Blue Marlin yet. Maybe it'll get better once I get more luck items. I had all of them in Wild World and maybe I just remember those instances after I already had so many of them. Yeah. I really don't care when it comes to something like Mario Kart or Smash Bros. online multiplayer (though I prefer to play with friends obviously) but in Animal Crossing I won't just play with anyone, no offense intended. Added you, Jacob. We should play sometime, maybe you'll bring me some luck with fish. I have absolutely no problem with bugs, just got back from an island haul with Mush and with Bell Boom I earned 220k in half an hour (more if I didn't already have one page filled with other stuff in my basket). No need for rain or specific times, either. Bugs are easier to miss but they're much more common and make up for that. If I paid more attention, I could easily get 250k or more in 30 minutes just from one island haul. I think we were just a bit earlier than that at around 10pm-11pm. Unless it's raining on Friday or Saturday, I won't be able to stay up that long then. I forgot when exactly I had my massive hauls in Wild World but I remember getting Blue Marlins and Sharks all the time and in New Leaf I haven't found a single Blue Marlin yet. Maybe it'll get better once I get more luck items. I had all of them in Wild World and maybe I just remember those instances after I already had so many of them. Yeah. I really don't care when it comes to something like Mario Kart or Smash Bros. online multiplayer (though I prefer to play with friends obviously) but in Animal Crossing I won't just play with anyone, no offense intended. Added you, Jacob. We should play sometime, maybe you'll bring me some luck with fish. I have absolutely no problem with bugs, just got back from an island haul with Mush and with Bell Boom I earned 220k in half an hour (more if I didn't already have one page filled with other stuff in my basket). No need for rain or specific times, either. Bugs are easier to miss but they're much more common and make up for that. If I paid more attention, I could easily get 250k or more in 30 minutes just from one island haul. By the way how do you edit your friend code for this game, as it appears up there? I want to add my fruit, like other people (which is oranges by the way. And I should get pears in a few days). What's Bell Boom? By the way how do you edit your friend code for this game, as it appears up there? I want to add my fruit, like other people (which is [b]oranges[/b] by the way. And I should get [b]pears[/b] in a few days). Added you, Jacob. We should play sometime, maybe you'll bring me some luck with fish. Absolutely! I'm planning to have an open door policy pretty much once I get most of you all added (added you too, Wayne! Just need to hit me back). Never used bugs as much of a cash crop before, but it sounds like the island really allows you to get some serious value from them. Haven't visited it yet, though I've had access for a while now. Just need to go do it! And finally got that watering can. Heh, I had refused to wade through the tutorials with Isabelle, so that was why I didn't have it. [quote]Added you, Jacob. We should play sometime, maybe you'll bring me some luck with fish. [/quote] Absolutely! I'm planning to have an open door policy pretty much once I get most of you all added (added you too, Wayne! Just need to hit me back). Never used bugs as much of a cash crop before, but it sounds like the island really allows you to get some serious value from them. Haven't visited it yet, though I've had access for a while now. Just need to go do it! And finally got that watering can. Heh, I had refused to wade through the tutorials with Isabelle, so that was why I didn't have it. I love animal crossing. I still have wildworld too. It's sooo cute. Finally got to the island today and made enough bells to pay off my bridge c: Wahey! I love animal crossing. I still have wildworld too. It's sooo cute. Finally got to the island today and made enough bells to pay off my bridge c: Wahey! [:: Lee Sanders :: Cubed-3 :: News Reporter :: Writer :: Head Of Secret Operations:: Resisdentual Slacker ::] On Twitter = LeeTSanders I have a Cubed3 limited Edition mug! I'm about to go spend $280 on a tux rental for a wedding . I'd much rather spend it on a 3DS and Animal Crossing. I guess that's what I get for being the best man. I'm about to go spend $280 on a tux rental for a wedding :S. I'd much rather spend it on a 3DS and Animal Crossing. I guess that's what I get for being the best man. Missymozzy - whats your code and I'll add you?